It was on March 20 — the day of the Holi festival — that a video of the father and brother of two Hindu sisters, Reena and Raveena, surfaced online. The men claimed that the underage teenagers were abducted from the Ghotki district of Sindh and were forced to change their religion from Hinduism to Islam. But things took a turn when the girls filed a court petition in Islamabad claiming that they were over 18 and had willingly converted to Islam, and married the men they wanted. They also sought protection from their family, claiming the family had harassed and threatened them. The Islamabad High Court (IHC) on Tuesday, placed both the girls in government custody and ordered a ‘fair and transparent inquiry’ into their circumstances, that is to be presented to the court in a week. This case has yet again brought to the fore the issue that has been haunting non-Muslim communities, especially Hindus, for the last several years. Most such complaints and cases are being reported on a regular basis from Sindh, where most of the Hindu community lives. “Abductions and forced conversions are some of the most serious problems Hindu women are facing these days,” says Birma Jesrani, a Hindu activist who led the ‘Stop Forced Conversions Action Committee’, a body of rights activists formed last week in Karachi, to show concerns over abductions. The body organised a protest on March 24 against the recent case of alleged conversion of Reena and Raveena outside the Karachi Press Club in which a large number of activists, Hindu community members and parliamentarians from opposition parties participated. Speakers at the protest said that minorities, especially Hindu, often do not receive the protection required from state institutions and lack access to justice. Community activists also claim that after kidnapping the girls, conversion and marriage were being used as legal cover to protect the abductors. “In such cases, girls were threatened into giving false statements in court,” Jesrani tells TNS. Activists say that the recent case has not only made a dent in the cause of religious harmony but has also violated the Sindh government’s Child Marriage Restraint Act, 2013 that bars the marriage of girls below the age of 18. A section of activists was very critical of the Pakistan Peoples Party (PPP) for shying away from a bill criminalising forced religious conversions, and subsequent forced marriages. In November 2016, the then Sindh Assembly had unanimously passed into law the Sindh Criminal Law (Protection of Minorities) Bill 2015 to make forced conversions punishable with a life sentence and forbade minors from changing their religion. However, the situation took an unpleasant turn when many religious parties, especially the Jamaat-e-Islami (JI) and the Jamiat-e-Ulema Islam-Fazl (JUI-F), took to the streets against the proposed law and announced a movement against it, following which the governor at the time, Justice Saeeduzzaman Siddiqui returned the bill to the assembly. The pressure of religious parties was so severe that the PPP’s supremo Asif Ali Zardari telephoned the JI chief Siraj Ul Haq, assuring him that the Sindh government would take back the forced conversion bill. Pakistan Muslim League-Functional MPA Nand Kumar Goklani, who had initially moved the bill against forced conversions, says he would raise the issue of abductions and forced conversions of the two girls in the Sindh Assembly. “It is now the community’s demand that Sindh government take up my bill and get it passed without any delay,” Goklani tells TNS. After the passage of the bill in 2016, the PPP celebrated it but ever since the bill was taken back, the party has been now mum on the issue while the bill seems to have been brushed under the carpet. A PPP MPA from the Hindu community familiar with the bill, says that Islamist parties had proposed to the Sindh government to remove the condition of age (18 years) for the conversion of religion. “The PPP is now not in the position to pass the bill again because it is mainly focused on NAB cases against the party’s central leaders; and could not annoy religious parties at this stage,” says the MPA, who requested anonymity. He says that the bill was unanimously passed in the previous assembly because there was no presence of religious parties, but in the current legislative body, the Tehreek-e-Labbaik Pakistan and the JI have representation that will oppose the bill inside and outside the assembly with full force. Amid the outrage of the recent case, Ramesh Kumar Vankwani, a Hindu parliamentarian from the ruling Pakistan Tehreek-e-Insaf (PTI), moved two bills in the National Assembly on March 26, seeking enhancement of punishment for those involved in forced conversions, and for making child marriage a cognisable offence. Besides Vankwani, PTI legislators Lal Malhi and Shunila Ruth, Pakistan Muslim League-Nawaz lawmaker Darshan and PPP’s Ramesh Lal signed the resolution. Pirs (spiritual leaders) of prominent shrines, such as Dargah Bharchundi Sharif and Sarhandi shrine, in rural Sindh, are hotbeds of such religious conversions where a number of Hindu girls and young women, mostly those belonging to Scheduled Castes — Bheel, Meghwar, Bhaagri and Kohli — have been converted to Islam. But, on the other hand, with an increase in the activities of various Islamic groups in rural Sindh, active efforts are being made to convert Scheduled Caste Hindu families by offering them material inducement such as ration, livestock and housing. “It is a purely voluntary process because it is un-Islamic to force someone to embrace Islam,” says an administrator of Dargah Bharchundi Sharif. After the recent worldwide incidents of attacks on the places of worship, especially the shootings at two mosques in New Zealand, a group of activists belonging to the Christian community have come up with a plan to form their own community-based security force with help of district administrations in order to protect churches and prevent terrorist attacks there. On Wednesday, leaders of the Pakistan Churches Security Council (PCSC), a newly formed body for protecting churches on self-help basis, said the body will train volunteers to identify suspicious people, spot unclaimed bags, and detect arms, bombs and other potentially dangerous objects. “We have confidence in our law enforcement agencies and our efforts will help them protect our worship places,” said Nauruus Ghori, who heads the PCSC. He added that police personnel deputed outside churches could not identify the suspicious people without help from the community. There are more than 1,200 churches in various parts of the city; however, law enforcement agencies (LEAs) provide security mainly to big churches, he said. “We have an estimated statistic that there are around 1,200 churches across the city and in some neighbourhoods, there are more than 30 churches,” Ghori told The News. He was of the view that it was impossible for the LEAs to protect all the churches in the city, due to which the PCSC was planning to train volunteers from each neighbourhood at the church-level to ensure security at their places of worship. Shepherd Anwar Javed, another activist from the Christian community, said the PCSC will start training volunteers from Karachi and it will expand the training to other parts of the country later. “With help of churches’ administration, we will identify a group of 10 to 15 youth from the community and then ask security organisations to provide them basic training including how to identify suspects coming to churches during religious festivals,” he said. “Within a year, we are planning to train at least 6,000 volunteers,” Javed maintained. As our religious festivals – Palm Sunday, Good Friday and Easter – are fast approaching, some churches have already started issuing identity cards and car stickers to the community members as part of increased security measures,” he said. Though the Muttahida Qaumi Movement-Pakistan (MQM-P) is still struggling to overcome the turmoil that beset it after it split away from the party founder Altaf Hussain and had to be renamed, which was followed by some of its central leaders defecting to the Pak Sarzameen Party (PSP) and the worst defeat of its electoral history in the 2018 general elections, the MQM-P has showed that it is still a significant political force in Karachi’s Urdu-speaking localities by winning the PS-94 by-poll on Sunday. The provincial assembly constituency of PS-94 falls in the Landhi area of the city and largely comprises lower-income Mohajir neighborhoods and pockets of Bengali and Burmese localities. 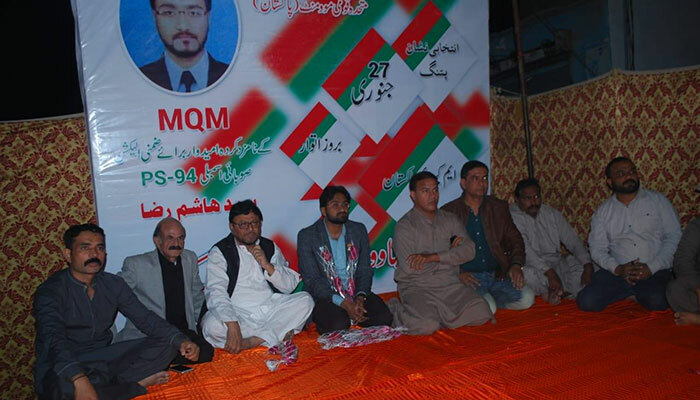 The seat fell vacant on November 27 after the death of MQM-P MPA Muhammad Wajahat who was suffering from cancer. Although 16 candidates took part in the by-elections, MQM-P candidate Syed Hashim Raza and Pakistan Tehreek-e-Insaf (PTI) candidate Ashraf Jabbar Qureshi were the key contenders. Among other candidates, PSP’s Muhammad Irfan Waheed, Mohajir Qaumi Movement-Haqiqi’s (MQM-H) Aamir Akhter and Pakistan Peoples Party’s Javed Shaikh were prominent. According to unofficial results, MQM-P’s Raza won the by-election by a comfortable margin, bagging 21,728 votes. The PTI candidate polled 9223 votes and was the runner-up. The MQM-H, PSP and PPP candidates were able to secure 5,854, 1,646 and 1,466 votes respectively. The voters’ turnout remained low at 18 per cent. The MQM-P had won the support of the Pakistan Muslim Alliance, a group representing Bengali and Burmese communities, while the Majlis Wahdat-e-Muslimeen, a political party representing Shias, and the Grand Democratic Alliance had announced their support for the PTI candidate. Polling activity largely remained lackluster on Sunday as much of the excitement from the day of the July 2018 general elections seemed missing at the polling stations. Except those of the MQM-P and the PTI, camps of political parties looked deserted. In the general polls of July 25, 2018, the MQM-P had emerged victorious in PS-94 with 32,729 votes. The Tehreek-e-Labbaik Pakistan (TLP) candidate was the runner-up who had bagged 14,030 votes. The PTI and MQM-H ranked third and fourth by bagging 13,636 and 10,828 votes respectively. This time, however, the TLP was not in the fray as the Election Commission of Pakistan did not allow it to contest the by-poll. The TLP has been facing a crackdown after the Barelvi group held massive protests in the country against the acquittal of Asia Bibi by the Supreme Court who had previously been sentenced to death for blasphemy. In the July 2018 general polls, the PTI emerged triumphant in Karachi by winning most of the national and provincial assembly seats. The MQM-P performed very poorly and managed to win only four National Assembly seats from Karachi out of a total 21 seats. The MQM-P also failed to win any of the following three by-polls in NA-243, NA-247 and PS-111 held in October last year. The PTI managed to secure all the three constituencies. On the other side, losing PS-94 by-polls is an embarrassing moment for the PTI which has been ruling the Centre. In the 2018 general elections and the initial by-polls, the PTI managed to fully exploit the MQM-P’s organisational weaknesses, internal rifts and, most importantly, the surge in non-traditional voters but now it seems that the party has begun to lose momentum. Local analysts believe that the PTI’s dismal performance in PS-94 would help its rivals, especially the MQM-P, support their claims that the July 25 results in the city were a one-off victory for the PTI and its popularity bubble had now burst. “We were expecting the defeat. It is mainly because of the lack of organisational structure and leaderships’ entire focus on affluent areas of DHA and Clifton,” admitted Amjad Hussain, a PTI supporter in 36-B area. Amid ongoing against the Tehreek-e-Labbaik Pakistan across the country, including Karachi, the religious group claimed that its candidate has been barred from taking part in the by-polls in the PS-94 constituency. The seat was fallen vacant after the death of the Mutahida Qaumi Movement-Pakistan’s MPA Muhammad Wajahat on November 27. He won the seat by securing 32729 votes in July 25 general polls while the TLP’s candidate ranked second by bagging 14030 votes. The by-polls in the constituency, comprising lower-income nieghbourhoods of Landhi, are scheduled on January 24. The TLP Karachi chief Allama Razi Hussaini Naqashbandi said that despite ranking second in the general election in the constituency, his party has been kept out on the by-polls by the government. “Our candidate was not allowed to submit nomination forms for the by-polls and through threats, illegal arrests and harassment, we are not allowed to continue our electoral activities,” said Naqashbandi. He said that the TLP was a registered political party and third largest party in Sindh Assembly. However, dozens of the TLP’s detained members announced to leave the religious party in recent weeks after signing agreements with the law enforcement agencies, the TLP sources told The News. Apparently helping its two male Sindh parliamentarians avoid being arrested in an ongoing crackdown, the TLP on December 3 had asked its female member of the provincial assembly to show its concerns over arrests of its workers across the country, including Karachi. Sarwat Fatima, the TLP’s lone woman MPA, along with few women leaders, spoke to a presser at the Karachi Press Club, saying that a number of workers and leaders had been arrested in the crackdown and the whereabouts of a large number of workers were also unknown. Before it, the Pakstian Sunni Tehreek, which supported the TLP in their sit-ins across the country, announced to stay away from the Rizvi’s party cand said that the PST and Ahle Sunnat community is peaceful and always condemned the hate speeches and violence. The TLP and its aggressive stance on blasphemy issues have attracted a significant number of like-minded and aggressive people, especially from the PST. Traditionally, most of the Barelvi groups, except the PST, enjoyed a reputation of moderation and non-violence as followers of Sufism. But in recent years, especially after Taseer’s murder, Barelvi groups, especially the TLP, have become more violent on blasphemy-related issues and are gaining political and street power within their community. No Barelvi group is on the Ministry of Interior’s roll of proscribed outfits. Two years ago, Sindh’s law enforcement agencies had asked the federal government to mount a watch on the TLP, saying that the outfit has been morphing into a militant outfit. The PST was on the interior ministry’s watch list for several years, but then it was taken off of it. KANDAHAR, Afghanistan — After the Chinese Consulate in a major Pakistani city was attacked by a squad of suicide bombers last month, Pakistani officials pointed fingers at the commander of a separatist group waging an insurgency in the southwestern province of Baluchistan. On Tuesday, a suicide bomber killed that commander, Aslam Baluch, along with five associates in an upscale neighborhood of Kandahar, in southern Afghanistan. No group claimed responsibility for the latest Kandahar bombing. But it is widely believed to be an act of revenge for November’s consulate assault, highlighting the cross-border trading of insurgents and attacks by proxy that remains at the heart of relations between Pakistan and Afghanistan. To Afghan officials, Tuesday’s attack bore the hallmarks of an operation directed by Pakistan’s military intelligence service, the I.S.I. “The bomber was sent and guided by the I.S.I.,” Maj. Gen. Tadin Khan, the police chief of Kandahar, said on Thursday. Though not specifically named by the authorities, the Taliban, many of whose leaders are believed to live in Pakistan, have carried out suicide bombings in southern Afghanistan in the past. Afghan and Western officials have long accused the Pakistani military, particularly its intelligence service, the I.S.I., of providing covert aid and direction to the Taliban as a way to wield influence in Afghanistan. In October, General Khan’s brother, Gen. Abdul Raziq, the powerful police chief of Kandahar, was killed by a teenage infiltrator who authorities said had trained in Pakistan. General Raziq was a staunch critic of Pakistan for harboring Taliban leaders. Pakistani officials, in turn, had accused General Raziq, who had a large network of informants and vast wealth, of stirring trouble in Baluchistan and assisting the Baluch separatists. Afghan officials confirmed that General Raziq had housed Baluch separatist leaders in Kandahar for years. The Baluchistan Liberation Army, of which Mr. Baluch was a major commander, has waged armed resistance against the Pakistani state for more than a decade, protesting discriminatory treatment and demanding autonomy for the province. The group has recently stepped up attacks against Pakistani military targets and Chinese targets. It sees China as an “oppressor” that is supporting the Pakistani government and plundering resources in Baluchistan. China is investing hundreds of millions of dollars to develop a port and an economic zone in the town of Gwadar in Baluchistan. The rebel group has established a brigade to carry out suicide attacks, named after a Baluch militant who carried out a failed attack on a Pakistani prime minister in the 1970s. In one of its first operations, last August, Aslam Baluch sent his own son to target a bus carrying Chinese engineers. Mr. Baluch arrived in Kandahar last week, according to some reports. He emerged from a meeting at a friend’s home in Aino Mina township on Tuesday, and as the participants walked to their cars, a suicide bomber approached and detonated his explosives. Amid slim turnout in the Sunday by-elections for 22 vacant seats of the local government system in Karachi, the Muttahida Qaumi Movement-Pakistan (MQM-P) has returned victorious by winning the maximum number of seats, 10, including one slot of UC chairman and two of vice chairmen, according to unofficial results received so far. Pakistan Peoples Party (PPP) came second by winning eight seats mainly from rural and underdeveloped areas of Malir, Lyari and Keamari. The vote casting ratio in the by-polls was very low, ranging from five to 10 per cent in various constituencies. The by-elections results seem to have reinvigorated the MQM-P in the city which could only win four National Assembly seats from Karachi out of total 21 seats in the recent general elections. Analysts believe that the results show that the MQM-P seems to be overcoming the turmoil that beset the party after it severed ties with Altaf Hussain and its internal rifts. On the other hand, the Pakistan Tehreek-e-Insaf (PTI), which won most of the national and provincial assembly seats from Karachi in the July 25 general polls and the following by-polls, showed a dismal performance in the local government by-polls. The local government seats for which by-elections were held on Sunday had fallen vacant due to resignations or deaths of the elected representatives. Firdous Shamin Naqvi, PTI leader and Leader of Opposition in the Sindh Assembly, Shah Nawaz Jadoon, PTI MPA from PS-113, Jam Abdul Karim Bijar, PPP MNA from NA-236, Saleem Baloch, PPP MPA from PS-89 and Hameed Uz Zaffar, MQM-P MPA from PS-121 had resigned from the posts of UC chairman, vice-chairman and district councillors after they emerged victorious in the general elections on July 25. Except one each, the PPP and PTI retained all the local government seats that had been vacated by their members. According to unofficial results, MQM-P’s Mustafeez Farooqi won after securing 1,507 votes against PTI’s Sheraz Nagani (696 votes) for the post of UC-22 Hyderi vice chairman. In Ward 4 of UC-2 New Karachi, MQM-P’s candidate (673) defeated PTI’s Zeeshan (90). In Ward-2 of UC-41 Liaquatabad, MQM-P’s Muhammad Faraz (595) defeated PTI’s candidate Muhammad Nawaz (85). In Ward 1 of UC-40 Liaquatabad, MQM-P’s Syed Nazimuddin (692) won the councillor’s seat by defeating PTI’s Babar Abbasi (230). In UC-18 Gulshan-e-Iqbal, PTI’s Niaz Ahmed (944) won the chairman seat and independent candidate Haji Hanif Jahangir (528) was the runner-up. The seat was vacated by PTI leader and PA opposition leader Naqvi. In UC-13 Jamshed Quarters, MQM-P’s Syed Irshad Ali (1,861) won the slot of UC chairman by defeating PTI’s Irfan Ali (715). The PTI could not retain its UC chairman slot in UC-45 Sikandarabad which had fallen vacant because of the resignation of PTI MPA Jadoon. The PTI candidate (1,047) lost to PPP’s Abdul Malik (1,757). In Ward 4 of UC-14 Banaras, the Awami National Party’s (ANP) candidate Umar Ali (747) emerged victorious after defeating PPP’s Noor Muhammad (428). In UC-41, PPP’s Ashgar Ali Shah defeated PTI’s Muhammad Yousaf. MQM-P MPA Zaffer had resigned from UC-11 Jaffer Tayyar after securing PA seat. The MQM-P retained the seat after defeating the PPP. In Ward 1 of UC-4 Majeed Colony, PPP’s Ubaidullah Akhunkhel (944) defeated ANP’s Muhammad Mairaj (382). In Ward 1 of UC-8 Moeenabad, independent candidate Muslim Khan defeated another independent candidate Mir Ahmed Gul. In the race for the councillor of Ward 2 of UC-13 Chakiwara, PPP’s Bashir Ahmed (776) defeated independent candidate Shabbir Bhatti (332). 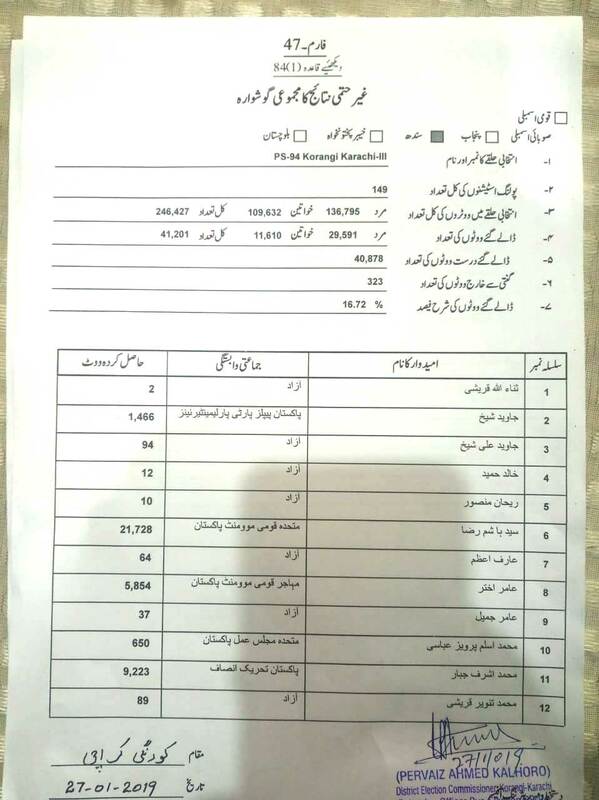 In Ward 4 of UC-20 Ranchore Line, MQM-P’s Mirza Faisal Manzoor (384) won and PTI’s Asmatullah (153) was runner-up. In UC-22’s Ward 1, MQM-P’s Wosran (508) won the general councilor seat, defeating PPP’s Mukesh Kumar (359). In Ward 2, PPP’s Zahid beat PTI’s Sajid Anwar Ahmed. In Ward 3 of UC-23 Nanakwara, PPP’s Aqeelur Rehman (786) defeated PTI’s Mohammad Moshin (643). In Ward 4 of UC-27 Ramswami, independent candidate Abdul Rasheed lost to MQM-P’s Muhammad Naeem Khan. In Ward 4 of UC-8 Natha Khan Goth, MQM-P’s Muhamamd Amir (533) won and defeated PPP’s Samar Zaidi (239). For the elections of the District Council Karachi, a separate borough for the city’s coastal and rural areas, three candidates, Akram Baloch from Ghaghar UC, Javed Memon from Murad Memon UC and Shedo Jhoko, were elected unopposed. Interestingly, the PPP and the powerful Bijar family suffered a setback after losing the seat of district councilor in Jam Murad Ali UC, which was vacated by PPP’s Bijar after he became an MNA, to an independent candidate Saddam Baloch. However, the PPP retained the seat vacated by MPA Baloch where its candidate Dad Kareem Baloch defeated PTI’s Ataullah Baloch. Expressing concern over arrests and harassment of religious scholars and prayer leaders, a representative body of Deobandi seminaries in the country has demanded that the government ease the registration process for madrasas and stop harassing clerics in the name of data collection. The demand was made at a meeting of clerics and prayer leaders of mosques organised on Thursday by the Wifaqul Madaris Al-Arabia (WMAA), a representative board of madrasas of Deobandi school of thought, at Jamia Farooqi, Karachi. The meeting was presided over by Maulana Adil Khan while the participants included Maulana Imdadullah Yousafzai, the board’ provincial head, along with Mufti Muhammad Naeem, Maulana Qari Abdul Rasheed, Mufti Muhammad Khalid, Maulana Dr Saeed Khan Sikandar, Qari Muhammad Usman, Dr Qasim Mehmood, Maulana Yousaf Afshani, Maulana Manzoor Mengal and others. According to a statement issued by the WMAA, the meeting asked the federal government to assign the responsibility of dealing with the affairs of madrasas exclusively to the federal education ministry. Currently, the affairs of madrasas are being dealt with by the interior and religious affairs ministries along with the National Counter-Terrorism Authority. The Deobandi madrasas’ body further demanded that the government deal with the madrasas’ affairs at the federal level instead of provincial levels. The Deobandi religious scholars also asked the government to review the process of registration of madrasas and make amendments in it so that the registration applications are not required to be sent to the home department. “Because of the complex procedure of registration and compulsion of clearance from various governmental bodies, it takes several months in the name of inquiries,” the statement reads. It was also demanded of the government that it instruct the banks not to make hurdles for madrasas in opening their bank accounts. Commenting on the distribution of forms for collecting information, the WMAA said the madrasas were not against providing information to the government and law enforcement agencies; however, they had reservations about the way it was being accomplished. “On a daily basis, personnel of various law enforcement agencies harass the madrasas officials in the name of data collection. We demand that the government assign one body for one-window operation for collecting the particulars of the madrassas,” the body said. The WMAA also expressed concern over whisking away of principals of various madrasas. Last week, officials of law enforcement agencies in plainclothes raided Madrassa Munba ul Uloom in the Manghopir neighborhood in the wee hours and picked up its principal Maulana Naseeb Mengal along with another cleric Maulana Saifullah. Their whereabouts are still unknown. “We demand that the government reveal whereabouts of the religious clerics picked up by law enforcement personnel mysteriously and present them in a court if they have some legal complaints against them,” the body demanded. The WMAA also decried the restrictions imposed on madrasas on the collection of hides of sacrificial animals during Eidul Azha and the arrests made in this regard. Rejecting the Punjab government’s charity bill, the WMAA termed it a curb on madrasas’ freedom and a move to deprive students from acquiring religious education. The Deobandi madrasas’ body said they would not tolerate such laws and propaganda against seminaries.